How complicated can it be to buy a weight belt I hear you say. Well you are right, it is not difficult at all but knowing the difference is something else. Long, Short, Pouches, Blocks, Bombs, Bags .. etc. First off is the belt, the belt consists of a length of webbing with a snap buckle and usually they all come in one length fits all. The weight belt in the picture above is the one for me with the possible exception of the tail clip, it's bright with an inox/stainless steel snap buckle. The reason I prefer this one is simple, first of all when dealing with students who quite often forget the weight belt, it is easy to see if it is there or not. 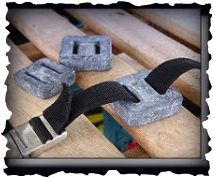 The buckle is hard wearing, corrosion resistant and again easy to see. The one biggest mistakes with weight belt is putting it on the wrong way around, there is a simple way to remember which way it goes. THE MALE IS ALWAYS RIGHT (sorry ladies) The male is the loose end, the female is the snap buckle, the male goes into the female .. You get the picture. Normally the belt is too long so what do you do with the tail end? If the belt is for your use only just cut off the excess leaving about 20cm excess, this will allow enough spare should you gain a few pounds or wear a thicker/dry suit and leave more than enough for your buddy to find it should the need to. The best way to cut it is with a very hot knife as this will also seal the end and prevent fraying, failing that, use a knife or scissors and then heat the end of the belt to melting point to seal it. These are a standard design weight and usually come in 1 kg and 2 kg units. Normally they are a grey, lead colour but I like white or yellow plastic coated as the are easy to see when laying around. If you need them, please, please use them. Nothing is more trouble than shifting weight during a dive, they also prevent the weight slipping off the belt should you accidentally pick it up by the wrong end.